We are pleased to announce that our ISO 9001:2008 certification has been renewed by Llyod’s Register Quality Assurance (LRQA) for all offices within the company. Our outstanding commitment to customer satisfaction resulted in no actions or findings being reported; this is a testament to the hard work and dedication by all our team members within Comtek. The ISO 9001:2008 standard addresses various provisions of quality management, ensuring we meet the needs of our customers and improve efficiency by providing the best customer service and top quality repairs. Internal audits were conducted to monitor how our quality management system was performing, verifying our focus on customer service and repair of telecommunications and data networking systems. The certificate, that is recognised worldwide, compliments our position as one of Europe’s fastest-growing telecoms repair companies. 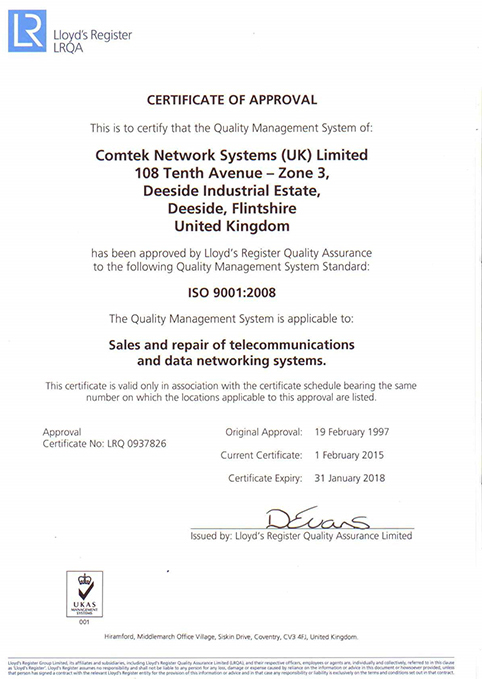 This is an exceptional accomplishment for Comtek and sets the foundation that ensures we continue to provide the best quality management; an area in which we continually develop to better our unbreakable commitment to first-class telecoms repair service.